We love catching up and hearing from the people who have adopted animals from Aanifeira. It can be from Portugal or in a foreign country and one person who constantly keeps us updated on her dog is Betty from France. 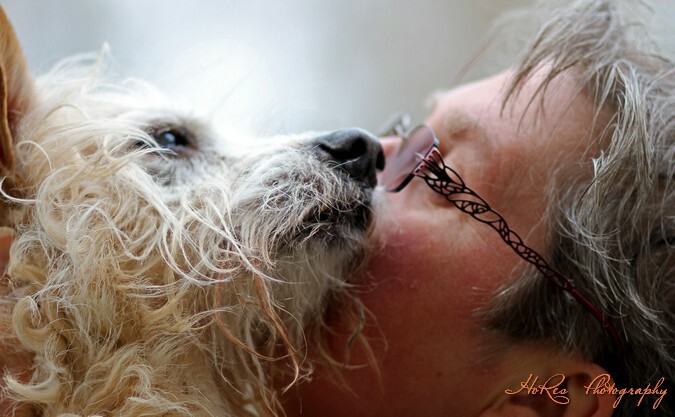 Betty adopted a beautiful old and blind Podengo (Portuguese breed of dog) called Sonia a little over three years ago. Sonia’s story is very sad one as no one was absolutely sure where she came from or when she actually entered into Aanifeira. In those days life was not easy for the dogs living at the shelter and fortunately Sonia was one of the hardier ones living in a corridor of the pavilion yet barely leaving her bed that she treasured so much. It would take a lot of coaxing to get her outside into the sunshine to spend time enjoying her surroundings as well as socializing with people. Although conditions generally were not the best there was always love and a helping hand from those who cared – the volunteers. The volunteers showed that they cared about the welfare of the animals and wanted to help the original founder of the shelter who deep in her heart only wanted the very best for the dogs. So with a lot of very hard work and understanding between all, things gradually improved eventually bringing the shelter to what it is today. Betty adopted Sonia just over three years and her story can be read here. She regularly she keeps us updated throughout the year on her health always sending a beautiful photo with each email. Here below are Betty’s comments each time she send us an email and photo. We do so enjoy receiving this and it still brings tears to our eyes to see this beautiful elderly and blind dog who received a new life when a kind lady heard about her and came to the shelter to give her a forever home. “Sonia is doing well, she loves her food twice a day and can clean my plate every night. Her ritual the last couple of days has become a bit less, event hough she still gets up after dinner 3-4 times, wants to drink, get off, a bit of food, a bit of drink again and then sleep. ” Yesterday evening around 6 pm Sonia gave up her food. W hen she later drank some water , she threw this out after half an hour too. The rest of the evening she was quiet, before bedtime she got some dry food and this stayed in. This morning I put her outside where she fell over and her legs subsided, I had to hold her to pee but she could not take any step without falling. Called the vet and he came at half past nine. By now it was already a lot better with her and she could walk by herself in the waiting room . The vet checked her, heart was good, little inflammation in eye , no fever so probably very likely a TIA caused by geriatric vestibular syndrome. She has had an injection of Candilat and must now take 2x a day a Candilat pill. Below is a slideshow of all the photos that she has sent us throughout the past year and half. This entry was posted in Animal Abuse, Animal Shelter, Animal Welfare, Senior Dog Adoption and tagged Animal Welfare, Disabled Animals, Podengos, Saving Lives, Senior Dog Adoption, Shelters and Rescues, Veterinarians, Volunteering in Animal Welfare. Bookmark the permalink.